The Pyrola pyrolyzers are designed for versatility. The pyrolysis conditions may be varied widely, and there is a variety of pyrolysis methods. For isothermal pyrolysis the sample can be heated up to a maximum temperature of 1400°C in 8 milliseconds. If the sample contains both volatile and non-volatile components it may be heated at a low temperature prior to pyrolysis to evaporate the volatiles. They can then be analysed separately. The unique design of the Pyrola pyrolyzers makes it possible to pyrolyze the same sample several times at increasing temperatures without reloading. Fast heating and cooling of the sample results in pyrograms at very well defined temperatures. By contrast, a slower heating and cooling will result in a “mixed” pyrogram of products from a wide temperature range. In fractionated pyrolysis each pyrolysis lasts typically 2 seconds, making a cryotrap unnecessary to focus the pyrolysis products prior to GC analysis. 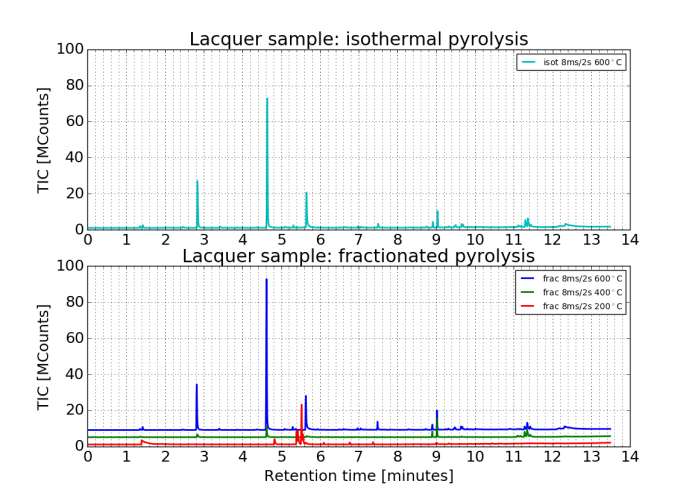 Sequential pyrolysis is tailor-made for kinetic studies of formation rates. The same sample is pyrolyzed repeatedly at the same temperature until the whole sample is degraded. By the precise control of the pyrolysis conditions the reaction rate can be derived. The procedure can be repeated at several temperatures. The heating and cooling is so fast that short heating pulses down to 100 milliseconds can be used. Then only the portion of the sample in direct contact with the filament gets pyrolyzed. This method is called pyrotomy and is useful for studying surface treatments or laminates.